The IN-USB-2 Infinity USB foot pedal control uses the USB Interface for maximum compatibility. The IN-USB-2 transcriber foot pedal is Windows and Mac compatible. The Infinity foot pedal pedal is the most popular transcription foot pedal available. With a wide, inclined, center Play pedal, the Infinity give you easy pivotal foot movement from Fast Forward to Rewind. 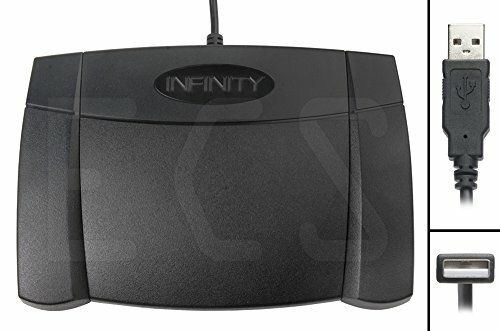 Weighing only 2.5 lbs., the Infinity Foot Pedal holds its own without being shuffled around underneath your desk with normal foot movement. Sturdy and durable design and ultra-heavy-duty micro switches to ensure countless hours of trouble free performance. The ergonomic design includes a wide, central, sloping Play pedal and the large size enables you to easily move your foot from the Play to Fast Forward or Rewind keys. If you have any questions about this product by Executive Communication Systems, contact us by completing and submitting the form below. If you are looking for a specif part number, please include it with your message.